We need not only an alternative bill for immigration reform, but an alternative lens through which we view migration and immigration. The enviornment we face in 2009/2010 is not the same as it was in 1986 or even 1996. Globalization is more developed now. With big businesses relocating to other countries, regional wars, unequal trade agreements and continued environmental degradation, displacement of people is at an all time high and a permanent feature of globalization. This is the lens through which we have to view migration and immigration policy in the U.S. The U.S., after all, is directly responsible or at least has influence, over much of the displacement worldwide. People are displaced by social and political forces and policies they have no control over. Over 200 million people are living outside their country of birth in search of stable sustainable employment to support families. That number keeps growing every year. Migration is not an accidental byproduct of free trade. The economies of the U.S. and wealthy countries depend on migration, on the labor provided by a constant flow of people. Congress and the administration aren’t trying to stop migration. Nothing can, not with trade agreements like NAFTA and CAFTA and the economic policies they represent. Immigration enforcement does not keep people from crossing the border, or prevent them from working. More accurately, immigration policy determines the status of people once they’re here. It enforces inequality among workers in rights, and in economic and social status. That inequality then produces lower wages and higher profits. U.S. immigration policy has historically been designed to supply labor to employers at a cost determined by employers. And at its most overt, that labor supply policy has made workers vulnerable to employers, who can withdraw their right to stay in the country by firing them. Recently the Council on Foreign Relations proposed two goals for U.S. immigration policy. “We should reform the legal immigration system,” it advocated, “so that it operates more efficiently, responds more accurately to labor market needs, and enhances U.S. competitiveness.” This essentially calls for using migration to supply labor at competitive, or low, wages. “We should restore the integrity of immigration laws,” the Council went on to say, “through an enforcement regime that strongly discourages employers and employees from operating outside that legal system.” This couples an enforcement regime like the one at present, with its raids and firings, to that labor supply system. All the immigration reform bills in Congress share the assumption that immigrants, even those with visas, shouldn’t have the same rights as the people in the community around them. For those without visas, the exclusion and inequality is even fiercer. And this is not a defacto exclusion or denial of rights. It is dejure denial, written into law, that justifies immigration raids in Laurel Mississippi, the firings of sewing machine operators in Los Angeles, and ankle bracelets, detention and kangaroo courts for meatpacking workers in Postville Iowa. The U.S. faces a choice in immigration policy direction. A corporate agenda on migration is promoted by powerful voices in Washington DC, like the Council on Foreign Relations and the employers’ lobby, the Essential Worker Immigration Coalition (think Wal-Mart, Marriott, Tyson Foods…). They propose managing the flow of migration with new guest worker programs, and increased penalties against those who try to migrate and work outside this system. Some of their proposals also contain a truncated legalization for the undocumented, but one that would disqualify most people or have them wait for years for visas, while removing employer liability for the undocumented workers they’ve already hired. Our own history tells us that a better direction is not only possible, but was partially achieved by the civil rights movement. In 1964, heroes of the Chicano movement like Bert Corona, Ernesto Galarza, Cesar Chavez and Dolores Huerta forced Congress to end the bracero program. The next year, Mexicans and Filipinos went out on strike in the fields of Coachella and Delano, and the United Farm Workers was born. The following year, in 1965, those leaders, together with many others, went back to Congress. Give us a law, they said, that doesn’t make workers into braceros or criminals behind barbed wire, into slaves for growers. Give us a law that affirms that family unity is essential. That was how we won the family preference system. We didn’t have that before. The civil rights movement won that law. That fight is not over. The Obama Administration won office on its promise of Change We Can Believe In. This is the time we need to assert the changes we want in immigration reform from the vantage point of the immigrant/migrant community. We may not have this opportunity for another 15 to 20 years. We have to stretch our imagination for reform beyond the limits of beltway lobbyists and employers to achieve true and just immigration reform. We have to fight for what we believe is in the best interest of immigrants themselves. Instead we are getting the same immigration reform proposals put forward in the Bush Administration, driven primarily by corporate employers reliant on an exploitable workforce. Those proposals continue to criminalize the immigrant population with heavy enforcement provisions denying them the same human rights as the rest of the U.S. population. First, we want legalization. 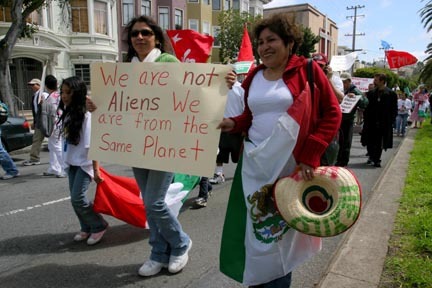 We want the 12 million people without legal status to quickly gain residence rights and green cards, without a waiting period, so they can live like normal human beings. We do not want immigration used as a cheap labor supply system, with workers paying off recruiters to get here and, once here, frightened that they’ll be deported if they lose their jobs. We need to get rid of the laws that make working a crime. Also, no more detention centers, no more ankle bracelets, no more firings and no-match letters, and no more raids. Immigrants need equality and rights. All people in our communities should be equal. We have to make sure that the decision-makers of Washington DC won’t plunge families in Mexico, El Salvador or Colombia into poverty, and force a new generation of workers to leave home to find jobs in furniture factories and laundries, office buildings and packing plants, on construction sites, or just in the gardens and nurseries of the rich. Families in countries where people are displaced by free trade and neoliberal policies deserve a decent life. They have a right to survive, a right to not migrate. To make that right a reality, they need jobs and productive farms, good schools and healthcare at home. Our government must stop negotiating trade agreements like NAFTA and CAFTA, and instead prohibit trade and economic policies that cause poverty and displacement. Those people who do choose to come here to work deserve the same things that every other worker does. We all have the same rights, and the same needs – jobs, schools, medical care, a decent place to live, and the right to walk the streets or drive our cars without fear. “If there is going to be change, real change, it will have to work its way from the bottom up, from the people themselves. That’s how change happens.” — Howard Zinn (NYT 1/30/10,). We forget that women once could not vote, that Blacks were slaves, and that even after they were ‘freed’ there was still segregation, that it was illegal for Blacks, Filipinos, and other people of color to marry whites, and on and on. It took peoples movements based on equal rights and justice for all to make these changes. We can have an immigration system that respects human rights. We can stop deportations. We can win security for working families on both sides of our borders. But, changes in immigration policy are not possible if we don’t fight at the same time for basic needs like jobs, education, housing, healthcare and justice for all. If we fight together, we can create a more just society for everyone, immigrant and non-immigrant alike. It is possible. Si se puede. The United Kingdom , France and Germany have seen major immigration since the end of World War II and have been debating the issue for decades. Foreign workers were brought in to those countries to help rebuild after the war, and many stayed. Political debates about immigration typically focus on statistics, the immigration law and policy, and the implementation of existing restrictions.